Estimated time to complete the experiment: 4 h. (Note: In order to complete the five experiments suggested below in a single lab session, we recommend that five similar setups be prepared and run simultaneously by different student teams). Note: The term pyrite commonly refers to the mineral FeS2. Ferrous sulfide, FeS is a precursor of FeS2 formation, resulting from the interaction of iron minerals with the products of biological sulfate reduction under anoxic conditions. Because the rate of oxidation of the latter may be greater than that of pyrite and it is commercially accessible, we selected FeS for the following experiments. Set up a system consisting of a 20-mL beaker equipped with a pH electrode, a small magnetic stirring bar, and a small-diameter plastic or rubber tube equipped with a Pasteur pipet or a glass tube (so as to bubble either air or nitrogen to a reaction mixture contained in the beaker). 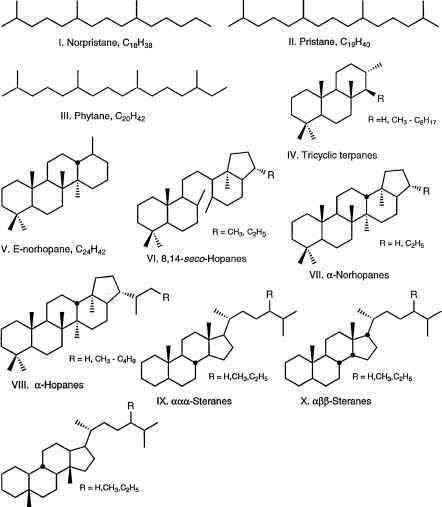 See Figure 1. Grind a few small pieces of commercial FeS with a mortar and pestle. Because grinding produces different degrees of surface oxidation, the instructor may wish to establish a "grinding protocol." Caution: Even though FeS is not generally regarded as a health hazard, it is advisable not to breathe its dust. Add 100 mg of the resulting powder to 10 mL of deionized water inside the beaker. Now, begin bubbling air by means of an aquarium pump (we have used a flow rate of 80 mL min-1) and turn on the stirrer. 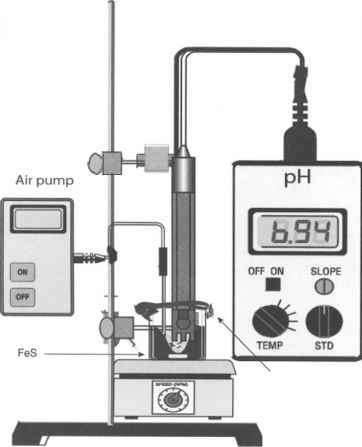 After a short equilibration period (e.g., 10 min, during which the pH is somewhat erratic), start monitoring pH as a function of time for at least 120 minutes (or more, if time permits). Plot the resulting pH vs time curve. In order to simulate reaction 3, repeat Experiment 1 but this time also add 10 mg of ferric sulfate to the reaction mixture and then monitor the pH as above. Repeat Experiment 2, but use nitrogen gas instead tissue, of air.